Student Ambassadors are School of Informatics and Computing undergraduate students. We look for students from a variety of different backgrounds. As an ambassador, you’re willing to support students who would like to learn more about our school and programs. In addition, you are outgoing, responsible, and a role model to others. Share your passion for the School of Informatics and Computing. Build communication, teamwork, and leadership skills. Gain experience for your resume. Connect and network with other students, staff, and faculty. Be part of the team with your own personalized name tag, ambassador shirt, and listing on our website. 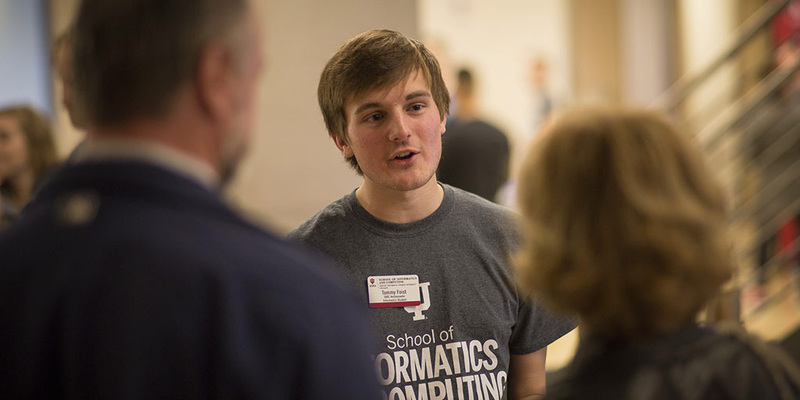 Dedicated to helping prospective students find their fit within the School of Informatics and Computing at IUPUI. Meet with visiting families and prospective students to educate them about the opportunities offered through Informatics and Computing. Lead tours and host student panels for those who come to visit us at IUPUI. Work recruitment events hosted by the Undergraduate Recruiters, and assist with IUPUI Admission events such as Jag Day, Decision Day, and Destination IUPUI. Have the opportunity to speak to students from the high school you graduated from, by visiting with an undergraduate recruiter. Be a full-time undergraduate student in the School of Informatics and Computing. Maintain a minimum GPA of 2.5 or above. Must be able to commit time to working events, monthly training, and ambassador socials. Must be flexible, passionate, and outgoing. Maintain a professional appearance and attitude when working with families and prospective students. Required to work at least two events to maintain active status as an ambassador.